If you've ever flown on Delta, you'll have heard this comment announcement, "If you have any items you wish to discard, please do so now as flight attendants begin to make one last round around the cabin," as the plane begins to make its descent. But there is far more to this PA message from the crew than just clearing away your rubbish towards the end of your Delta flight. Recyclable goods like empty soda/drinks cans and plastic bottles are gathered from tray tables, handed off to a flight attendant, then, at Delta, they are likely transformed into a home. It is true, trash can make a home, last Friday in Atlanta, Delta employees worked alongside two Atlanta families to put the finishing touches on the 10th and 11th Habitat for Humanity homes funded by the airline's Inflight Recycling Programme. The programme has raised $1 million in proceeds for Habitat since 2007 when flight attendant Susan Powell first started the innovative programme. To reduce waste on Delta flights, paper, plastic and aluminium from food and beverage products are collected and transported to recycling centres in 36 cities worldwide. So far on this programme, they have recycled over 230 tons of aluminium, which is enough to make five A350 aircraft. In a quaint neighbourhood, miles from the Atlanta airport, two single-mothers and their children stood misty-eyed on the porches of their new homes at the dedication. "My house leader knew exactly what I wanted; from the railing, up to my windows, everything was so me," said first-time Habitat homeowner Kedre Clark. "My kids and I want to say thank you, guys," added her now neighbour, Demetrius Harvey, with her 76-piece homeowner toolkit in hand. "I can only describe this as a blessing.". The next-door homes were numbers 260 and 261 Delta has built with Habitat in 12 countries. In ten short days, Delta employees volunteered 4,800 hours building alongside the future homeowners. Volunteers were led by Kim Mills-Smith and Scott Meader, build coordinators and husband and wife, who met onsite at a Delta-Habitat build. And, among the volunteers was a band of Delta employees who travel the world together building Habitat homes. "Helping our neighbours soar is core to who we are at Delta," said Tad Hutcheson – Managing Director, Community Engagement. 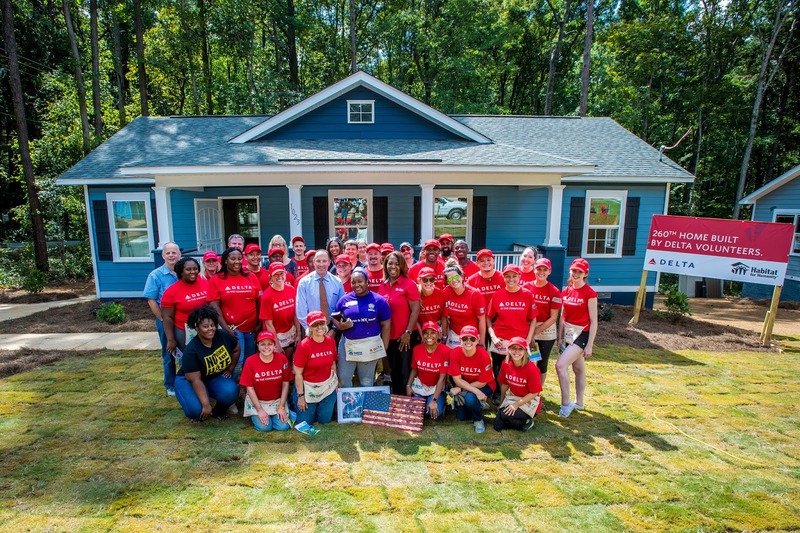 "The two new homes in our backyard mark the commitment we've built with Habitat to make Atlanta — and the world — stronger, safer and prepared for a sustainable future." Families in need of decent, affordable housing can apply for homeownership with their local Habitat for Humanity. Local Habitat family selection committees choose homeowners based on three criteria: the applicant's level of need, their willingness to partner with Habitat, and their ability to repay an affordable mortgage. As part of their willingness to partner, Habitat's homeowners invest hundreds of hours of their own labour, called "sweat equity," working alongside volunteers and other Habitat homeowners. "The proceeds from Delta's Inflight Recycling Program have helped empower so many families to build strength, stability and independence through shelter," said Julie Laird Davis, Vice President of Corporate and Foundation Relations for Habitat for Humanity International. "We are thankful for the ongoing support and partnership with Delta that allows us to continue to serve families in need of affordable housing and a decent place to call home." The Inflight Recycling Program, which has helped make homeownership possible for families in five cities, illustrates the airline's commitment to Global Health and Wellness as well as sustainability. Annually, Delta contributes 1 % of its net profits to charitable organizations like Habitat — a sum that totalled over $45 million last year. Each year, over 2,500 Delta employees volunteer their time and talent with Habitat to build homes in the U.S. and internationally to offer families safe and affordable homes. Following Delta's Global Build in Guangzhou, China in April, the airline also has builds in New York, Seattle and Los Angeles in its flight plan this fall.